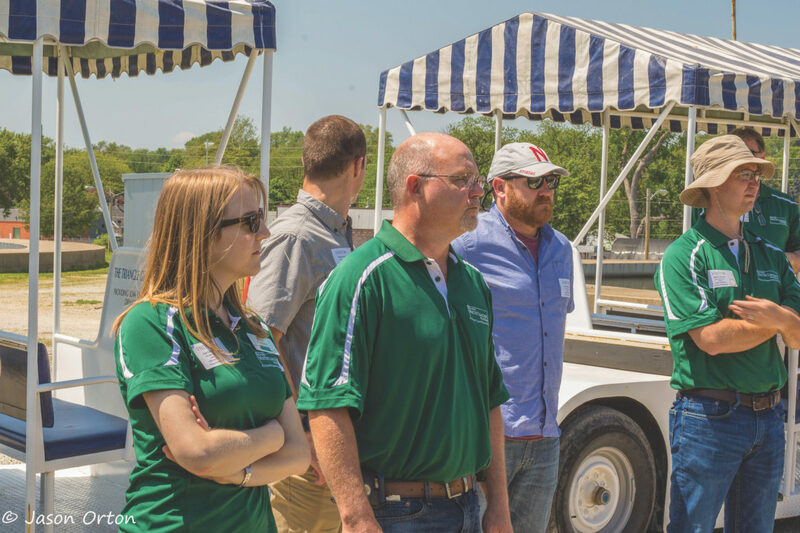 The Nebraska Water Leaders Academy, founded in 2011, is a professional leadership program that trains water resources professionals in leadership skills and technical knowledge. Over the course of six sessions, participants learn about the different geographical areas of the state of Nebraska and about a variety of water subjects and leadership skills, all while building valuable, industry-crossing relationships with their fellow students. 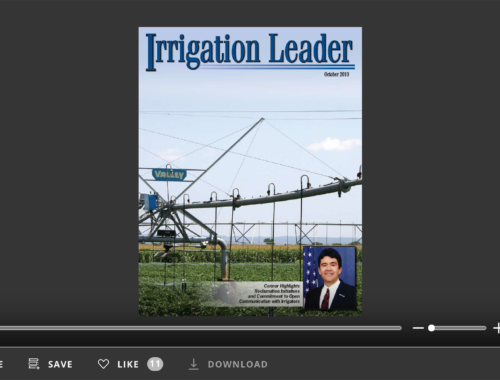 In this interview, Lee Orton, the executive director of the Nebraska State Irrigation Association, and Tom Knutson, the association’s former academy planning committee chair, talk with Irrigation Leader’s editor-in-chief, Kris Polly, about the origins of the academy and its accomplishments over the last decade. Kris Polly: Please tell us about the thinking behind the creation of the academy and how it came into existence. 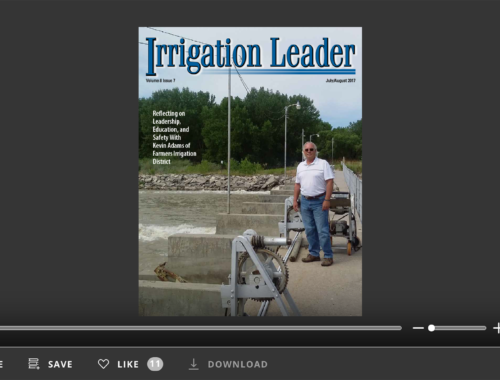 Lee Orton: I operate several associations from my offices in Lincoln, and we did a leadership academy for an association that represents the groundwater well drilling profession in Nebraska. It was successful in bringing some new, younger people into the association’s leadership. That idea developed a little bit, and I spoke with Tom, who was the president of the Nebraska State Irrigation Association (NSIA) at the time, about the success we’d had there, and the fact that we needed to find some younger people to get involved and invested in the water industry as well. Tom and I put together a proposal, and with his sales capabilities, we took it to Diamond Plastics, which was then doing, and continues to do, a lot of business in Nebraska and across the West. Diamond Plastics was enthused and excited about the concept and gave us a founding donation. Over the years, the company has given us over $60,000 to support the program. Next, we sought support from the Nebraska Environmental Trust (NET). 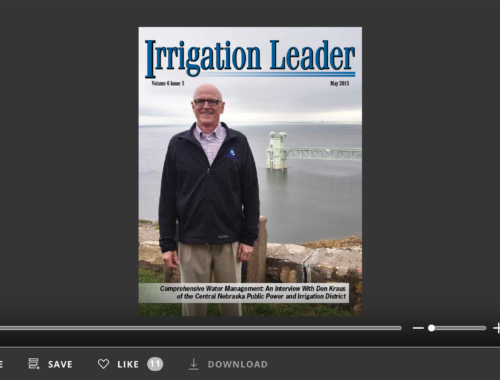 I think that at the time, they thought our focus was narrower than it was—that all we were doing was building irrigation district leadership in Nebraska, when in fact we were looking for people who would be water policy leaders across the entire state. We didn’t get funding from NET that first year, but when we went back the second year, the trust saw that we had been working diligently to recruit participants from a wide range of water resources interest backgrounds and from across the state. From that point forward, NET has given us significant support: Last year, they gave us over $80,000. NET is now invested in this process as well. Other important partners in this operation include two people from the University of Nebraska–Lincoln’s School of Natural Resources. We’ve partnered with them from the very beginning. Not only do they bring their vital leadership-skills training to the academy as academy planners and instructors, but they help bring other university-based people to the academy faculty as well. The lead person in that effort is Dr. Mark Burbach. The program has been successful. When I’m out soliciting funds to help support the program or just explaining it to people across the state and country, I say that it is designed to help people in the water business learn how to play together. We don’t do that well all the time. 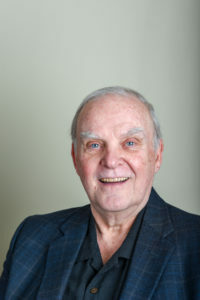 Tom Knutson: As Lee mentioned, when he and I were first discussing the idea for the academy, I was president of the NSIA, a position I’d held for two or three terms. The question on my mind was, “Where are all our leaders?” That’s why I thought Lee’s idea was superb. I knew that we needed folks from across the state to be involved in the new generation of leaders as we deal with all the groundwater and surface water issues in Nebraska. Kris Polly: When did the program begin? Lee Orton: The first class began in 2011. Kris Polly: What is the format of the program, and what skills does it impart? Lee Orton: It’s a 1-year program that includes six sessions—1 every 2 months. We take the participants all over the state of Nebraska so that they can see, feel, and experience water resources in the various geographic areas of the state. Most years, we start by going from Lincoln to Kearney, where we see the sandhill cranes. In May we go to Omaha, and in July we go to the Scotts Bluff area to see the Nile Valley of Nebraska and its irrigation activity. Our September session is typically at Valentine on the Niobrara River—we do a boat trip down the river, which is an important recreational area. We finish the year in November in Nebraska City, where we look at the history and politics of the Missouri River and do some closing activities, including a report from each of the teams we have put together over the course of the year to do a project of their own. Sometimes that project takes on a life of its own after the end of the year. We’ve had several successful team efforts in that regard. We cover leadership skills and technical issues, including water law in Nebraska, the history of compacts and decrees, the political structure of the State of Nebraska, climate and geology, water resources conservation activities around the state, water policy development procedures, and the economic effects of water resources policy decisions. Because the participants are deliberately recruited from different backgrounds and have different interests in what the outcome of water resources decisions are, they learn to understand each other’s perspectives and how to better communicate with each other. They also develop longstanding friendships and relationships that serve a purpose after they finish the academy. Kris Polly: What is the application process like? Lee Orton: We have an open-enrollment program, which is currently open from early September to early December. Applications used to be submitted on paper, but now they can be submitted electronically through our website. The application materials include a résumé; a letter of intent explaining why the applicant wants to participate in the academy; and a statement from the applicant’s support the applicant in the program, stating that the employer will be dedicated to making sure that the applicant will be involved throughout the year. The applicant also submits a $500 down payment on their tuition. We want everyone to have some skin in the game, which is what the $500 is intended for. It is reimbursed to unsuccessful applicants. The application materials are submitted to a committee that makes a determination based on qualifications. On only a few occasions have we had more applications than we were willing to accept. Successful applicants are notified in early December; they then provide us with some additional information and join us at the first session, which is typically in late January. The total tuition for the program is $2,000, which pays for all the activities. Sometimes we give scholarship support to participants who don’t have the necessary funds. Getting to and from the academy location is the responsibility of the participants. The cost to us of producing the academy is $5,000– $6,000 per person per year. The funds that make up the difference between that cost and the tuition come from NET funds and support from private enterprises like Diamond Plastics, representatives of the center-pivot manufacturers group in Nebraska, a number of our NSIA members, and other people who are interested in water resources. We have some in-kind contributions as well, including from faculty who donate their time. Kris Polly: What is the ideal class size? Lee Orton: Based on the relationships that are built in these class sessions, we have made the determination that we don’t want more than 20 people in the academy at a time. We have reached that maximum in 4 of the 8 years we’ve completed so far. The 2019 academy class is a group of 17, but there are also 4 people who have deferred until next year because of scheduling conflicts. Attendance has been good. A few times, participants have been unable to attend every one of the six sessions, but in every case but one, those individuals actually came back the next year to fill in the session they missed. We’ve had good commitment. In all the years the academy has existed, we’ve only had one person withdraw from the program partway through, and yet when he was interviewed by a local newspaper, he raved about how successful it had been. Kris Polly: Tell us about your alumni. Tom Knutson: We have 120 alumni at this point. A number of them are elected officials, a number are in management, and a number are professionally involved in engineering firms and private entities. It is rewarding to know that what we have created is valuable for the state of Nebraska. Lee Orton: Three people who have graduated from the academy actually have jobs in Washington, DC, today. 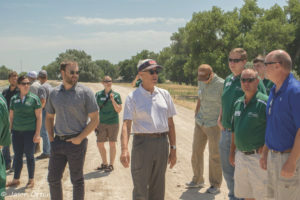 We have at least a half dozen alumni who have gone from the private sector to serve on natural resources district boards of directors, we have a couple who are on irrigation district boards of directors, and we have people who are involved in Nebraska-based leadership in groups like Ducks Unlimited and the Nature Conservancy. You can see that our graduates have implemented their leadership-skills training. Kris Polly: What is your message to other states that may not have irrigation leadership programs? Lee Orton: I don’t know how they can get on without one, frankly. It is imperative to train the next generation of water resources professionals to understand policy issues and to be good leaders. I would encourage every state to do something of this nature. Kris Polly: How can people learn more about this program? Lee Orton: They can go to the NSIA website or to the Water Leaders Academy website to see what we’re all about and how to apply. The website also has information about the demographics of past applicants and explains some of the program activities. They can also contact us directly. We would love to share information about this program because we think this can and should be carried out elsewhere. 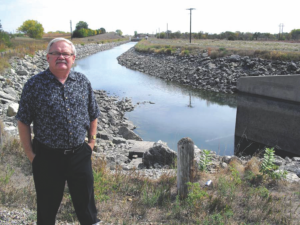 For more information about the Nebraska Water Leaders Academy, visit its website at waterleadersacademy.org/. Lee Orton can be contacted at (402) 476-0162 or lee@h2oboy.net. Tom Knutson can be contacted at (308) 754-8699 or tom.knutson819@gmail.com.